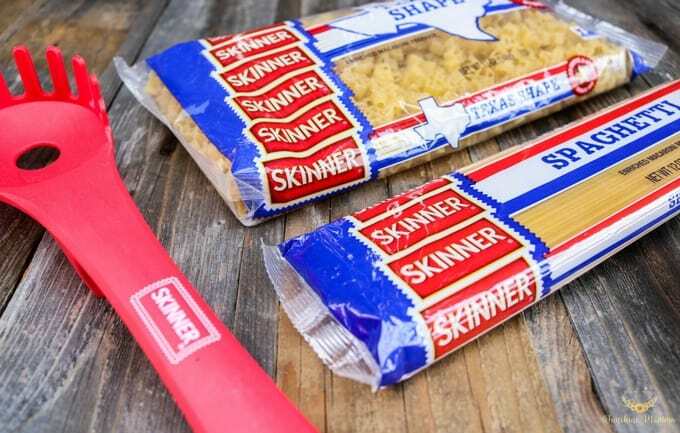 This is a sponsored post written by me on behalf of Skinner® pasta. 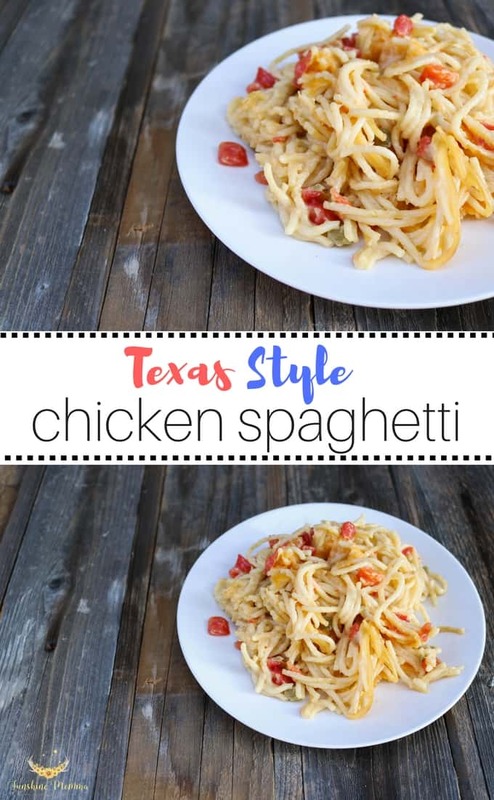 One of my favorite recipes that my mom used to make our family when we were kids is this delicious and easy chicken spaghetti recipe. Every time I make it I feel like I am back in my momma’s kitchen as a little girl helping her make it. My mom has been making pasta for our family for as long as I can remember and I am carrying this on by doing the same thing in my home. I learned this recipe entirely from her, down to the exact kind of ingredients to use! I love making this recipe when we have friends or family over because it is inviting and it feeds a lot of people for a great price. I think that pasta, in general, is a great dish to serve your friends and family. It is warm, makes people feel good, and fills their bellies! We always use Skinner pasta varieties in our home for our pasta recipes because the quality is perfect (seriously, everyone I know LOVES it) and it is very cost friendly for a young mom like me. It is also the #1 pasta brand in Texas and being a proud Texas girl I’ve gotta stick to my roots of course! 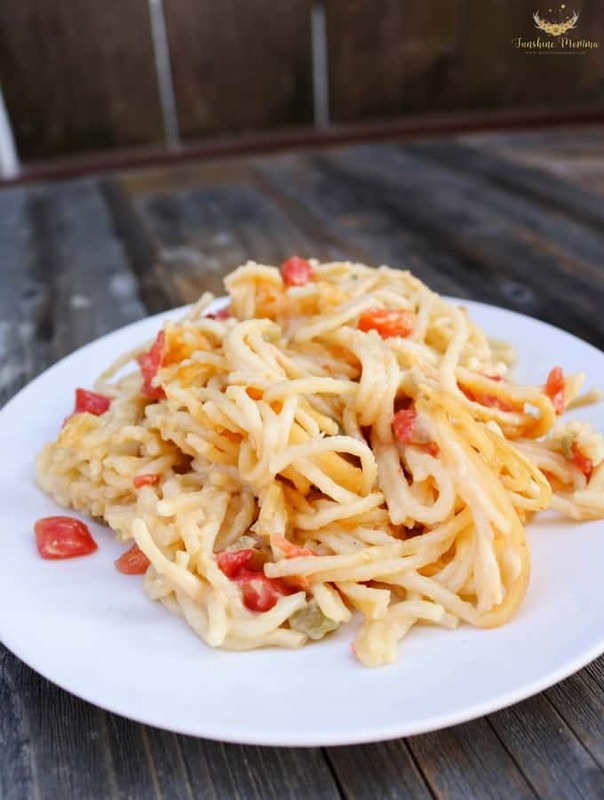 I usually use regular spaghetti noodles for this recipe, but you can really use any kind of noodles. 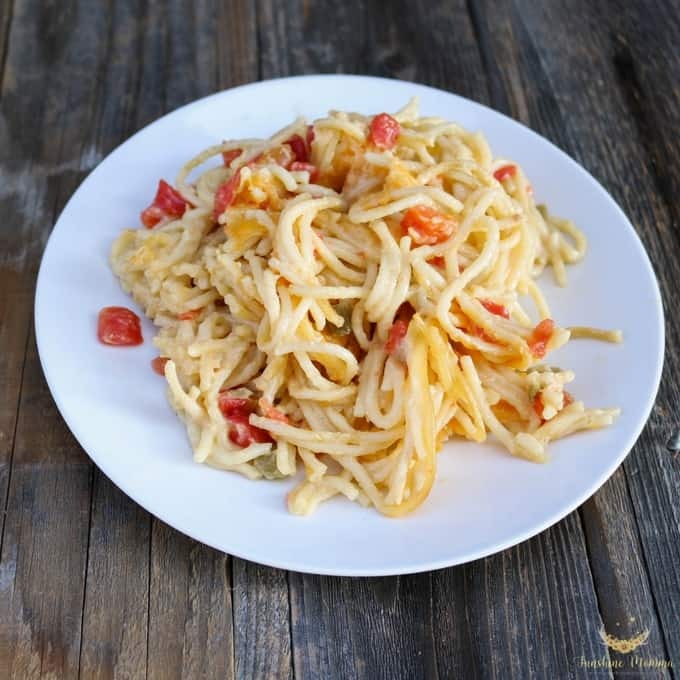 Skinner pasta carries all kinds of varieties from the basic spaghetti noodles to Skinner Texas Shape pasta, like I used in this three cheese macaroni recipe! No matter what pasta variety I use the revipe always turns out amazing, it is the friendliest pasta brand in Texas! This recipe is so simple it will blow your mind. Which I know is ideal for busy moms who are trying to make their meals warm and inviting while not spending hours in the kitchen. From start to finish, this recipe will take you about 35 minutes and only 10 of that is prep. All you need is 6 simple ingredients to make this delicious meal. I love whipping this up on a weeknight and I can grab Skinner pasta from most of the stores in the area. You’ll need 2 pots. One to cook your noodles in and the other to mix together and warm up the cream of chicken soup, cream of celery soup, canned chicken, and Rotel. This recipe can be switched up easily if you don’t like one of the ingredients. I have used cream of mushroom soup before, I have used chicken breast, and I have even grabbed a rotisserie style chicken from the store and used that meat! 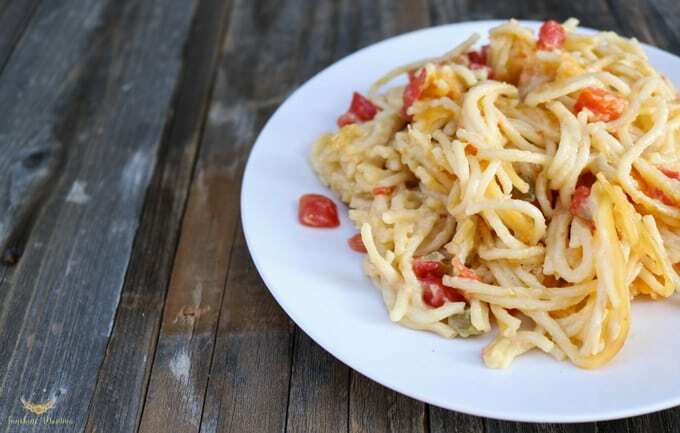 After you cook the pasta and heat the other ingredients up on the stovetop, combine the two together in the bigger pot and stir until the liquid mixture evenly covers the pasta. Then pour the mixture into a 13×9 baking dish and top with cheddar cheese. Then bake it at 350° for 25 minutes and you are done! On low, use a saucepan to combine and heat canned chicken breast, cream of celery soup, cream of chicken soup, and Rotel. Combine Skinner pasta and sauce mixture until the pasta is evenly coated. Pour pasta mixture into a 13×9 baking dish and top with shredded cheddar cheese.